Please enjoy these inspirational quotes by Benjamin Franklin. I am the lord of myself, accountable to none. Search others for their virtues, thyself for thy vices. and for want of a horse the rider was lost. An ounce of prevention is worth a pound of cure. A little neglect may breed great mischief. for the mind as well as the body. there is nothing in its nature to produce happiness. The more of it one has the more one wants. to keep his friends in countenance. or assuredly we shall all hang separately. Never leave that till tomorrow which you can do today. greater to tell him his. Half a truth is often a great lie. most assuredly, we shall all hang separately. Energy and persistence conquer all things. or worry about what may never happen. no man can take it away from him. The way to see by faith is to shut the eye of reason. they for use were made. What's a sundial in the shade? but Babbling is ever a folly. for that's the stuff life is made of. He that would fish, must venture his bait. forgiving it sets you above him. for that is the stuff that life is made of. Guests, like fish, begin to smell after three days. and at forty, the judgment. Make yourself sheep and the wolves will eat you. People who are wrapped up in themselves make small packages. He that hath a Trade, hath an Estate. but fools will learn in no other. Love your Neighbor; yet don't pull down your Hedge. There was never a good war or a bad peace. A learned blockhead is a greater blockhead than an ignorant one. A good conscience is a continual Christmas. A countryman between two lawyers is like a fish between two cats. serious work of the world. those that are movable, and those that move. All wars are follies, very expensive and very mischievous ones. A life of leisure and a life of laziness are two things. There will be sleeping enough in the grave. A small leak can sink a great ship. A great empire, like a great cake, is most easily diminished at the edges. depends on whose solicitor has given me my brief. Hunger is the best pickle. Change of any sort requires courage. 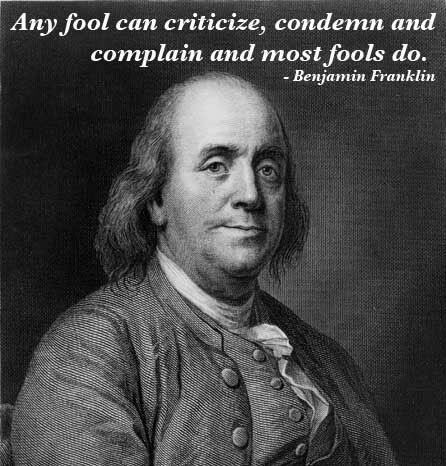 Thank you for visiting: Benjamin Franklin Quotes.